Rachele Mussolini (née Guidi; 11 April 1890 – 30 October 1979), also known (particularly in Italy) as Donna Rachele  (Italian for "Lady Rachael"), was the wife of Italian dictator Benito Mussolini. Rachele Mussolini was born Rachele Guidi in Predappio, Romagna, Kingdom of Italy (Regno d'Italia). She was born into a peasant family and was the daughter of Agostino Guidi and wife Anna Lombardi. After the death of her father, her mother became the lover of the widowed Alessandro Mussolini. Alessandro Mussolini was the father of Italian Fascist founder and leader Benito Mussolini. He was an Italian revolutionary socialist activist with Italian nationalist sympathies. Mussolini was a blacksmith by profession. Mussolini was married to Rosa Maltoni, a schoolteacher, who became the mother of Benito Mussolini. 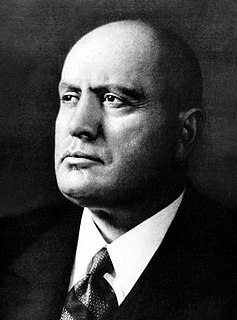 Mussolini exercised considerable influence over his son Benito's early political beliefs, even naming his son Benito Amilcare Andrea Mussolini after three leaders he admired: Benito Juárez, Amilcare Cipriani, and Andrea Costa. In 1910, Rachele Guidi moved in with Alessandro's son Benito Mussolini. In 1914, Mussolini married his first wife Ida Dalser. Though the records of this marriage were destroyed by Mussolini's government, an edict from the city of Milan ordering Mussolini to make maintenance payments to “his wife Ida Dalser” and their child was overlooked. Shortly before his son Benito Albino Mussolini was born to Ida Dalser, Rachele Guidi and Benito Mussolini were married in a civil ceremony in Treviglio, Lombardy on 17 December 1915. In 1925, they renewed their vows in a religious service (after Mussolini's rise to power). Ida Irene Dalser was the first wife of Italian fascist dictator Benito Mussolini. 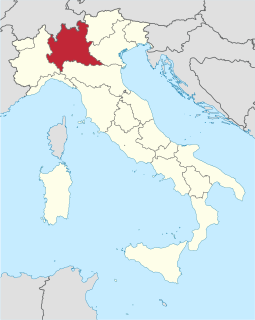 Treviglio is a town and comune in the province of Bergamo, in Lombardy, Northern Italy. It lies 20 kilometres south of the province capital, in the lower territory called "Bassa Bergamasca". Rachele Mussolini bore five children by Benito Mussolini and she was willing to ignore his various mistresses. Rachele and Benito Mussolini had two daughters, Edda (1910–1995) and Anna Maria (1929–1968), and three sons Vittorio (1916–1997), Bruno (1918–1941), and Romano (1927–2006). Edda Mussolini was the child of Benito Mussolini, Italy's fascist dictator from 1922 to 1943. Upon her marriage to fascist propagandist and foreign minister Galeazzo Ciano, she became Edda Ciano, Countess of Cortellazzo and Buccari. Her husband was executed in January 1944 for dissenting from Mussolini's rule. She strongly denied her involvement in the National Fascist Party regime and had an affair with a Communist after her father's execution by the Italian partisans in April 1945. Bruno Mussolini was the son of Italian dictator Benito Mussolini and Mussolini's wife Rachele. During the reign of Mussolini's Fascist regime, Rachele Mussolini was portrayed as the model Fascist housewife and mother. She remained loyal to Mussolini until the end. But, on 28 April 1945, she was not with Mussolini when he and his mistress, Claretta Petacci, were captured and executed by Italian partisans. Rachele Mussolini did try to flee from Italy after World War II but, in April 1945, she was arrested in Como, close to Switzerland by Italian partisans. She was turned over to the United States Army and kept on Ischia Island, but was released after several months. Clara Petacci, known as Claretta Petacci, was a mistress of the Italian dictator Benito Mussolini, and was executed with him by partisans. 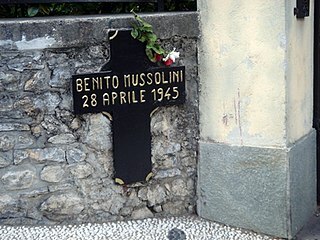 The death of Benito Mussolini, the deposed Italian fascist dictator, occurred on 28 April 1945, in the final days of World War II in Europe, when he was summarily executed by Italian partisans in the small village of Giulino di Mezzegra in northern Italy. The official version of events is that Mussolini was shot by Walter Audisio, a communist partisan who used the nom de guerre of "Colonel Valerio". However, since the end of the war, the circumstances of Mussolini's death, and the identity of his killer, have been subjects of continuing confusion, dispute and controversy in Italy. In her later life, Rachele Mussolini ran a restaurant in her native village of Predappio, where she served pasta dishes. She eventually received a pension from the Italian Republic in 1975. It turned out that Mussolini had not received a salary from the state, and therefore she could not receive a pension. After her husband's execution, she begged to have his body for private burial, in vain. Romano Mussolini was an Italian jazz pianist, painter and film producer. He was the fourth and youngest son of Benito Mussolini, fascist dictator of Italy from 1922 to 1943. The Campo Verano is a cemetery in Rome, Italy, founded in the early 19th century. The cemetery is currently divided into sections: the Jewish cemetery, the Catholic cemetery, and the monument to the victims of World War I.
Giulino is an Italian frazione of the Comune of Mezzegra, in the province of Como. Since 21 January 2014 both Giulino and Mezzegra are included in the comune of Tremezzina. Walter Audisio was an Italian partisan and communist politician. He was imprisoned before World War II for his anti-fascist activities. As a senior partisan he was involved in the death of Benito Mussolini, possibly being the individual who killed the dictator and his mistress. After the war he served as an Italian deputy and later as a senator. Nicola Bombacci, born at Civitella di Romagna, was an Italian Marxist revolutionary, prominent during the first half of the 20th century. He began in the Italian Socialist Party as an opponent of the reformist wing and became a founding member of the Communist Party of Italy in 1921, sitting on the fifteen-man Central Committee. During the latter part of his life, particularly during the Second World War, Bombacci allied with Benito Mussolini and the Italian Social Republic against the Allied invasion of Italy. He met his death after being shot by partisans and his cadaver was subsequently strung up in Piazzale Loreto. 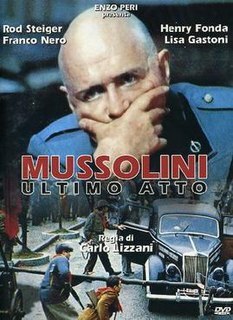 Mussolini and I is a 1985 TV docu-drama, directed by Alberto Negrin, about the strained relationship between Italy's fascist dictator Benito Mussolini and his son-in-law and foreign minister, Count Galeazzo Ciano, based on Ciano's diaries. Made in English as an Italian-French-German-Swiss-Spanish-US co-production, with Bob Hoskins, Anthony Hopkins and Susan Sarandon in the leading roles, it first aired on Rai Uno on 15 April 1985 in a 130-minute version. On 8 September 1985, it premiered in the USA on HBO in an extended four-hour version. Vincere is an Italian film based on the life of Benito Mussolini's first wife. It stars Giovanna Mezzogiorno as Ida Dalser and Filippo Timi as Benito Mussolini. It was filmed under the direction of Marco Bellocchio, who also wrote the screenplay with Daniela Ceselli, and it was released 22 May 2009 in Italy. It was the only Italian film in competition at the 2009 Cannes Film Festival. Last Days of Mussolini is a 1975 Italian historical drama film directed by Carlo Lizzani and starring Rod Steiger, Franco Nero and Lisa Gastoni. 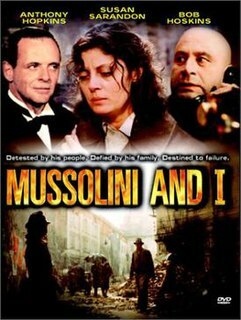 The film depicts the downfall of the Italian dictator Benito Mussolini. Arnaldo Mussolini was an Italian journalist and politician. He was the brother of Italy's Fascist dictator Benito Mussolini, and a Fascist himself. 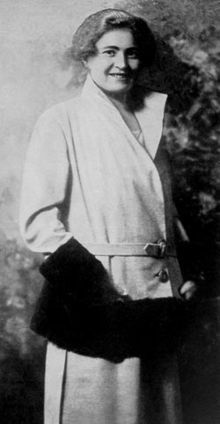 Wikimedia Commons has media related to Rachele Mussolini . ↑ "Rachele Mussolini Dies, Fascist Dictator's Widow". Washington Post. 31 October 1979. ↑ Owen, Richard (13 January 2005). "Power-mad Mussolini sacrificed wife and son". The Times. Archived from the original on 29 June 2011. ↑ Mussolini, Rachele; Zarca, Albert (1974). Mussolini: an intimate biography. Morrow. ISBN 978-0-688-00266-4.